I had been working up to getting a good time on a 12km run, and looking to improve my cardio for a national competition 2 weeks after. I had been pushing hard, doing up to three sessions a day of running, swimming, cycling and BJJ. My plan was to push it hard, then ease up during the final week getting to complete rest at the end of the week. Unfortunately my plans came unstuck, as I over did it and went into an overreaching phase. As you can see by the attached image from Overtraining Monitor, I was getting some early warning signs in the form of raises in resting heart rate. Then on the Thursday I had a raised resting heart rate with a corresponding drop in weight, followed by my resting heart rate remaining raised. By the Saturday I was on the mat wrestling and I was slow, gassed and feeling flat. 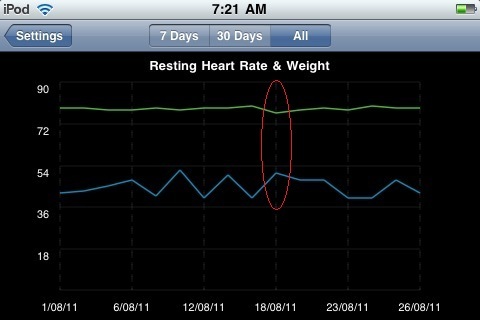 After a couple of days of complete rest, you can see my resting heart rate drops back down to the low 40’s. The following peak is my typical Thursday morning peak, where I have a big session late on Wednesday night, and don’t appear to have recovered by the time I measure about 8 hours later. Yep, would it be possible to have some trends in graph ? Like average in 7 days or so ? I have just submitted a new version to Apple that provides separate Heart Rate and Weight graphs, a trend line using simple linear regression and more detailed graphs. It will be released, once Apple approves it, which is usually within 7 days.